Shea has been reduced to a pile of rubble next to the new stadium. If Citigroup wants the subway sign to be stamped with their corporate name they are going to have to cough up more bailout money, says the MTA. 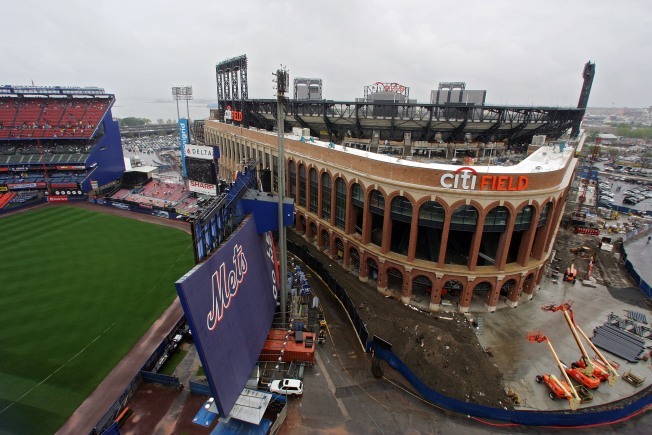 Until they do, fans can be expected to be greeted a "Mets/Willets Point" sign for opening day. It might have been nice to even leave the old sign, letting fans nostalgic for their purple abomination have a last moment with it when they saw the old familiar "Willets Point/ Shea Stadium" sign. Fans at other parks with corporate sponsors they'd just as soon forget (like say, a busted bank) have come up with creative names for their home fields, so as to avoid choking on the awkward corporate entity all season long. There are those, of course, who miss Shea. Not for its bright orange seats or uncomfortable sight lines, but for the memories of Tommy Agee's outfield grabs, Jesse Orosco hurling his glove into the air, or the time time they spent with their fathers and sons there. Still there is no way this new building can be called Shea, so the subway signs come down and they'll say Mets, but it's up to ESPN commentators, WFAN play-by-play guys, New York sports writers and the fans to come with a new and enduring and popularly assigned designation — with the added bonus of helping us all forget Citibank, even though their name is on the front of the stadium.